The small stall that we use to house our goats. On our farm we have a tiny barn with a little stall. It had been used for tool storage, and it needed some modifications to appropriately house our two Kinder goats. We wanted to keep costs low, but provide everything that the goats need to be healthy and happy. The interior wall of the stall. Our first step was to make sure that the slats were close enough together that the small goats couldn’t squeeze through an opening. We used 2 x 4’s to fill in any gaps. We also made sure that the stall doors latched tight, and that the goats couldn’t reach the latches. The wall mounted bucket for water. 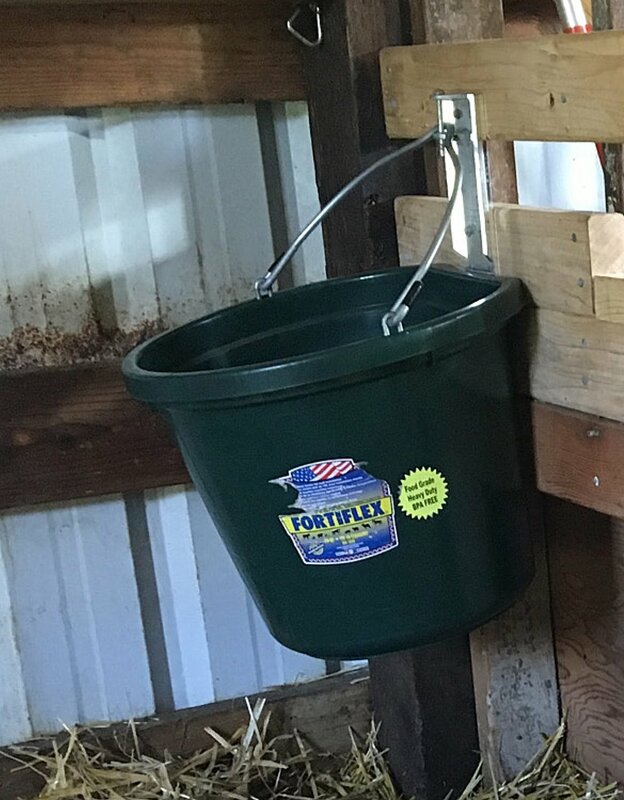 We got our heavy duty water bucket at Tractor Supply along with a bracket. The bracket is a great thing because it keeps the bucket from getting dumped. It is important to keep the water off the ground and away from food. Goats like very clean water. "Free choice" minerals for our goats. The goat mineral and baking soda containers are also from Tractor Supply. We provide these items ‘free choice’. We secured these trays by making putting hinges on a 2 x 4 cut to length. We added a handle, so that when the board is pushed in, the trays lock into place. Pulling on the handle lifts up the board and allows you to pull the trays out. We use a bungee cord for forage feeding which keeps the forage on the ledge and off of the ground. Goats won’t eat off the ground. Even if their forage falls on the stall floor and I put it back up for them to eat, they won’t touch it. Keyhole hay feeder that reduces waste. The hay feeder is made from a standard rubbermaid tote with ‘keyhole’ openings and ventilation slits cut out of the lid. Joel cut the holes using a box cutter. He first drew on tote with sharpie and then covered the area to be cut with painter’s tape to prevent the plastic from cracking. He could still see the sharpie lines, so he just cut out the openings. He then bolted the tote to a 2 x 4 that he had screwed into the barn wall. Feeding kitchen scraps to the goats. Sometimes we feed our goats fruit and vegetable kitchen scraps. For this we added a bucket on a chain. This also works for feeding them grain. We added some extra stone pavers that we had so the goats could step on them and reach up when they were small. We use straw on the floor of the stall. We typically use straw for bedding although many people use spent or fresh hay. I prefer straw because it seems to absorb more moisture. Goat milking stand based on Mother Earth News plans. Our milking stand was constructed using Mother Earth News plans. A milking stand is not necessary for young goats, but we wanted to get our does used to it. We use it for hoof trimming and it makes for good entertainment on rainy days. The sacrifice area for our goats. An outside enclosure gives the goats some extra space, and some fresh air. Even when it is too rainy for the goats to go to their electric fence enclosure, we leave the stall door open during the day. Any outside enclosure should be considered a ‘sacrifice area’ since the goats will eat or tromp on the vegetation, strip the bark off any trees. It is important to make sure there are no poisonous plants in any fenced area (portable or permanent). 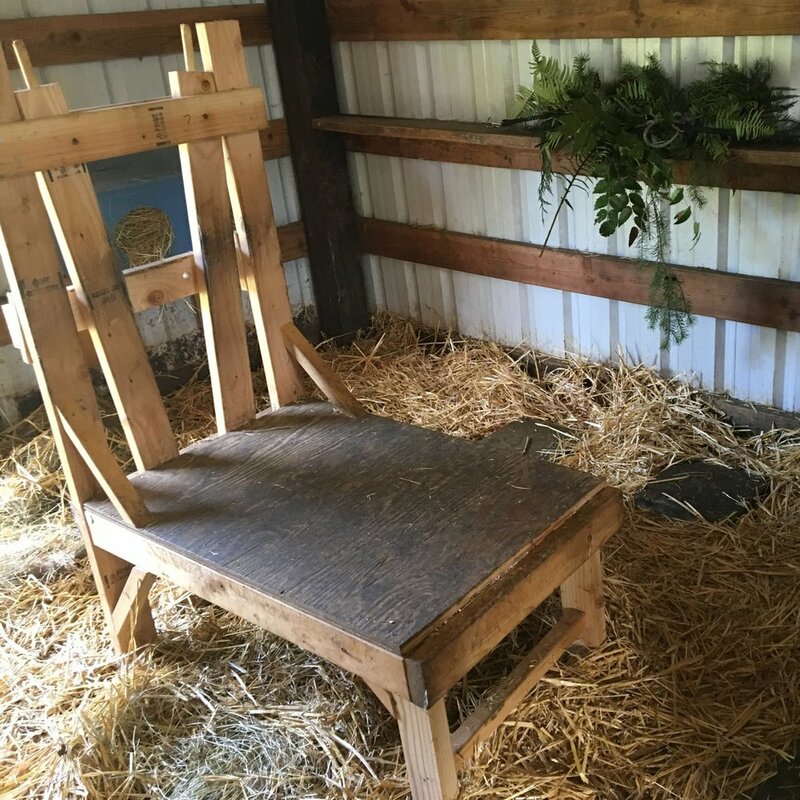 The general layout of our goat stall. In future posts we'll talk about goat nutrition and forage feeding.